A Broadstairs author and former principal of a language school has published a new book based on the industry in the fictitious, seaside town of Bradgate. Richard Lewis has lived in Broadstairs since the early 1980s. He has had a varied career in teaching and education management, including several years as the principal of the language school and as the academic director of an international language organisation. He is the author of a textbook for teaching English, a bestselling adaptation of a classic novel for learners of English, two autobiographical novels and three books of local history. 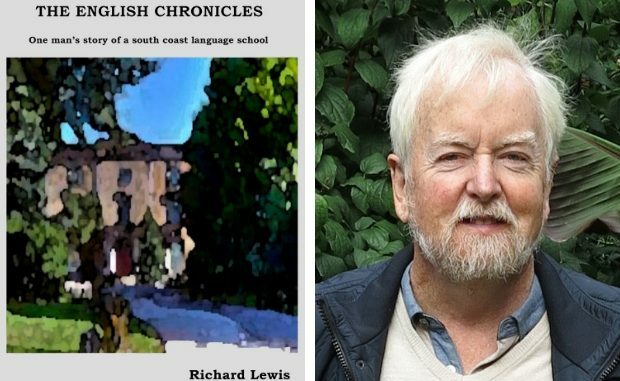 And he has now published The English Chronicles– one man’s story of a south coast language school, which takes a humorous look at the life and times of the fictitiously-named Darwin College of English. The book has distinct echoes of Thanet, unsurprising given the author’s interest in isle history and his books on the associations of famous artists and writers with the district. The story describes how a small language school is bought by an aristocratic businessman, how a new principal, Robert Llewellyn, is appointed and how the school is moved from the anonymous semi-detached house in residential Darwin Avenue to the grander location of Southmead House in a nearby park. The first part of the book charts the struggles the principal and his wife have to establish the school in its new home, to build it up and against the odds to turn it into a success. The narrative moves on to a series of vignettes illustrating the more memorable students and the events that take place around them. The book ends with the tragi-comic circumstances leading to the principal’s resignation and departure and the school’s eventually closure. Its a pity that he hasn’t spoken about the collusion and price fixing between all and the devious ways that schools earn out of the host families. After X number of years I have learnt the dishonest practices that many of the schools use.